Recordings of Wagner operas generally fall into two categories, recent ones with good audio and ancient (well 1950s/60s) ones with good singing. 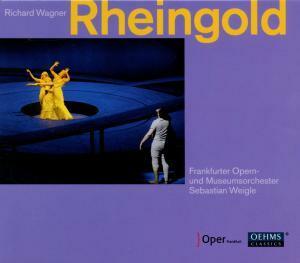 This Rheingold is about the closest I've heard to the almost mythical ideal of a Wagner recording in which both the performance and the engineering are of the highest quality. But good as the playing and singing is, it is the sound quality that really distinguishes this recording. OEHMS are well known for their commitment to superior sound engineering, but it is not often they set themselves the challenge of maintaining those standards in the context of a live opera recording. A note in the booklet thanks the make-up team for their co-operation in enabling the on-stage recording, which suggests the engineers have taken some liberties in terms of microphone placement. Judging by the copious production stills that illustrate the libretto (yes, there's a libretto too), the sound engineers have also had the advantage of less than fussy staging. That's not to say that the designs are minimalist, just that it seems unlikely that any of the sets have interfered with the sound quality. The orchestra too sounds excellent. There is plenty of bass in the mix. So, for example, there is no question of the opening Rhine theme appearing out of nowhere; even at their pianissimo dynamic, the double basses are an immediate presence with their Eb pedal. And as the Prelude unfolds, it becomes clear that every single member of the string section is going to be clearly defined in the soundscape. In general, the balance is good, although most other live recordings of Wagner operas give the singers more prominence over the orchestra. To be honest, I prefer a more orchestra heavy balance anyway, especially when the orchestral playing is to this standard. This dramatic presence from the audio compensates for a slight lack of characterisation on the part of the singers. This seems like more of a hindrance on first listening than the second time round, but most of the voices are not particularly distinguishable from each other, making the whole effect more symphonic than it might otherwise be, especially given the increased prominence of the orchestra. There are exceptions of course, Hans-Jürgen Lazar and Jochen Schmeckenbecher as Mime and Alberich respectively both sound like pretty nasty characters, just from the various tone colours they employ. The Rhinemaidens sing as an impressively unified ensemble, an effect complemented by the high quality audio, that despite their unity is still able to pick out the individual voices. Terje Stensvold has quite a modest voice, which could threaten the credibility of his Wotan. Fortunately, his timing, poise and tone colour combine to fill out the part, and despite a general lack of vocal power, he is still able to command every scene he appears in. Sebastian Weigle has a real intuition for Wagner's dramatic pacing. He makes the most of all the set pieces, especially the orchestral interludes, but never exaggerates the tempo indications he finds in the score. His Wagner is much like that of Christian Thielemann, dramatic and full blooded, and with every musician performing to their full expressive potential. But Weigle is more subtle than Thielemann, more measured and less interventionist. A recommendation then from me for this Rhinegold, especially to those who have been waiting since the dawn of digital technology for a Wagner recording in audio quality that can do the music justice. If I didn't know better, I could have sworn that this was an SACD, and a good one too. And while the singing is to an excellent standard, the orchestra come over as the real stars. That's partly for the quality of their playing, but also for the combination of Wagner's excellent orchestration and the sound quality that demonstrates how the details are as fine as the whole. My lasting impression of the final bars of the work, as the gods enter Valhalla, is of the loudest contrabass trombone playing I've ever heard. This ought to be a controversial issue, and my opinions were divided the first time I listened. After all, what is the point of hiring seven harpists solely for this passage when all you can hear is one player at the back of the brass? But Wagner gives the contrabass trombone the melody, mostly below the bass clef I think, and by pumping it out at these exceptional dynamics (and without losing anything in sound quality), it really brings a sense of profundity to these closing bars. Sebastian Weigle may be a moderate when it comes to tempo issues, but by giving these brass players their heads, he shows he's anything but a control freak.